Whether it's their birthday or yours, celebrate the big day with rich chocolate covered pretzels that are a truly delicious gift. Indulge in crisp Bavarian pretzels smothered in milk chocolate and candy confetti, white fudge with milk decorative drizzle, milk chocolate with candy gems and smooth ,milk chocolate with nonpareils. 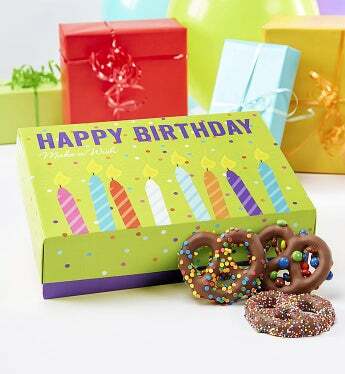 Arrives in a festive Happy Birthday box featuring a birthday candle design.